The Indigenous Australian rugby league team (also known as the Indigenous All Stars or Indigenous Dreamtime team) is a rugby league football team that represents Aboriginal Australians and Torres Strait Islanders. The team was first formed in 1973 and currently plays in an annual All Stars Match against a National Rugby League NRL All Stars team. An Aboriginal v white Australian rugby league game was held in Barcaldine in Western Queensland in 1963. These 'Blacks v Whites' games continued annually until 1984. The first Australian Aboriginal rugby league team was assembled in 1973 The Aboriginal team managed to win seven of its nine matches in just 10 days, The team consisted of 34 players – 19 from NSW, 13 from Queensland and two from the Northern Territory. They went on to win games against Kiwi premiers Wellington Petone, the only all-Maori team & Auckland club & Te Atatu, which the Aboriginal side won 17–13. The side competed in the Pacific Cup in 1990, 1992 and 1994. During this period the team contained New South Wales Rugby League first grade players such as Ricky Walford, Graham Lyons, Ron Gibbs, Darrell Trindall, Paul Davis, Wayne Alberts, George Longbottom and Will Robinson. In the post-1999 NRL season an Aboriginal side managed by Arthur Beetson defeated the Papua New Guinea Kumuls and the future rugby league Immortal was pushing for an Australia Day match against the Australian national team. In 2008 World Cup curtain raiser to the Australia vs. New Zealand match included an Indigenous Australian squad playing against New Zealand Māori which featured several prominent NRL players and rising stars, including Chris Sandow, Wairangi Koopu, Preston Campbell, Sam Thaiday, Shaun Kenny-Dowall and Carl Webb. Preston Campbell, a highly respected aboriginal rugby league player, was a driving force behind the setup, in 2010, of a curtain raising match between the Indigenous All Stars, and the NRL All Stars. 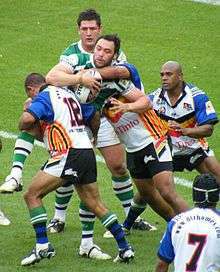 The Indigenous All Stars played what seems likely become an annual match against the National Rugby League All Stars on 13 February 2010. The squad was chosen in part by public vote. Aboriginal NRL player Sid Domic's artistic ability led him to be selected from a field of six artists to design the Indigenous side's jersey, as well as Johnathan Thurston's and Jamie Soward's custom headgear, for the annual All Stars matches. The NRL launched a Festival of Indigenous Rugby League program to take the place of the prestigious pre-season Rugby League All Stars game following every World Cup year.The 2014 Festival of Indigenous Rugby League featured a trial match between the Knights and a non-elite Indigenous team, drawn from the immensely popular NSW Koori Rugby League Knockout and Murri Carnivals in Queensland, as well as the NRL Indigenous Player Cultural Camp, Murri vs Koori women’s and Under 16s representative games, a Murri v Koori match, a jobs expo and community visits. ↑ AAP (16 October 2009). "Indigenous All Stars by name, and nature". ABC. Retrieved 8 December 2009. ↑ Malone, Paul (10 October 2008). "Sam Thaiday in Indigenous Dreamtime team for Rugby League World Cup Article f". The Courier-Mail. Retrieved 8 December 2009. ↑ AAP (3 November 2007). "We need to follow footprints of Barcaldine". The Age. Australia: Fairfax Media. ↑ AAP, (18 February 1973). "Aboriginal team wins". The Sydney Morning Herald. Australia: Fairfax Media. Retrieved 10 August 2010. ↑ Hanna, Jim (16 October 1999). "Artie wants first pick, then a Test against Fittler and Co.". AAP Sports News. Australia: The Gale Group, Inc. Retrieved 10 August 2010. ↑ Jodie van de Wetering and Kallee Buchanan (10 February 2010). "All Stars' jerseys emblazoned with Domic's designs". ABC News. Australia: ABC. Retrieved 6 February 2011.